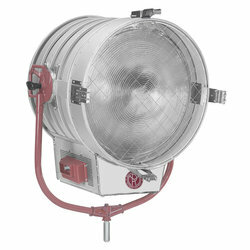 The brightest Tungsten lighting fixture is now available in 20,000 watt configuration. The globe, in conjunction with the traditional 24 3/4″ Fresnel lens, allows increased light output for greater coverage from a single fixture. The design also includes circular channel construction for added strength and more efficient airflow, resulting in cooler operation. Ideal for basic set lighting techniques in Motion Picture, Television and the Professional Photographic Industries. Equipped with safety screen. 240 volts, A.C. or D.C., 100 amps max.-20,000 watts max. Mogul Bipost. Spring loaded contacts. 100 amp., quick-make, quick-break. Mounted in trough. Light aluminum with vertical circular interlocking channels for ventilation and a louvered trough with aluminum end castings. Tubular aluminum and aluminum castings with 11/8" dia. steel yoke pin. 243/4" dia. curved Fresnel lens 21.8° to 66.5° field angle. 33" x 33" x 293/4".